This content is available for registered users, please sign in or register. If you've already registered please enter your email and password. Registering is exceptionally quick, easy, and FREE! We require it to keep our materials exclusive. E-books, Articles, and Educational Reports. We do not share your information with third parties. Questions? Use the navigation panel to the right to jump ahead to a particular section. If you have any questions after reading this commodities trading educational material, or about anything included in here, don't hesitate to call us at (800) 454-9572 U.S. or (310) 859-9572 International. You can also go to Page Two of the chart patterns advanced futures trader educational material. What is an Ascending Triangle Futures Chart Pattern? An ascending triangle is a bullish futures pattern that can indicate a breakout in the upwards direction. How do I Recognize an Ascending Triangle Futures Chart Pattern? An ascending triangle is formed when resistance remains flat and support rises. 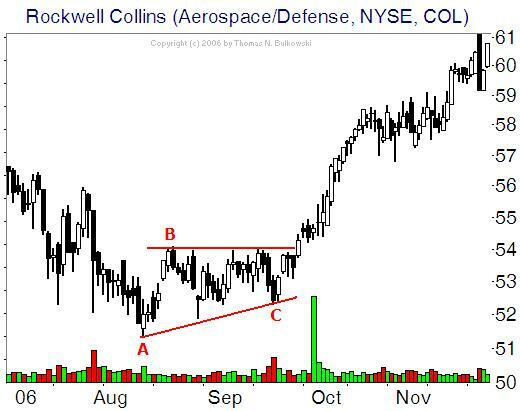 What Does a Ascending Triangle Chart Pattern Mean? The price will rise and fall within the triangle until support and resistance converge. At that point, the apex, breakout occurs, usually upwards. What is a Broadening Top Futures Chart Pattern? A broadening top is a futures chart pattern that can occur on an upwards trend. It is generally classified as a reversal pattern but some traders argue that there is approximately a 50/50 split between whether it tends to move upwards or downwards upon completion of the pattern. For this reason, it can often be avoided by traders. It can be viewed as the opposite of a symmetrical triangle. How Do I Recognize a Broadening Top Futures Chart Pattern? A broadening top is comprised of diverging support and resistance lines and resembles a megaphone. The rising resistance line and falling support line continue until the trend reverses. 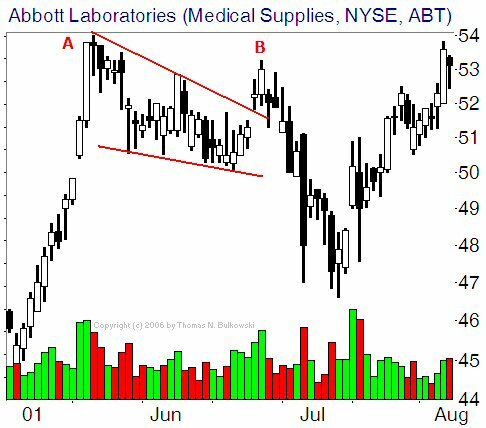 What Does a Broadening Top Chart Pattern Mean? This is a less common futures chart pattern pointing to a highly unstable market. As support drops and resistance rises, volatility increases. What is a broadening bottom Futures Chart Pattern? 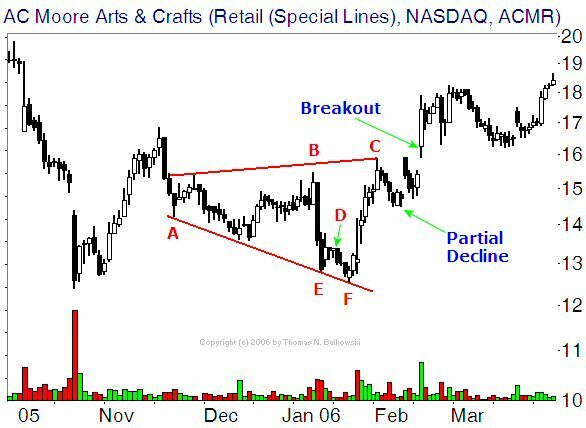 A broadening bottom is a chart pattern that can occur on an downward trend. It is generally classified as a reversal pattern but some traders argue that there is approximately a 50/50 split between whether it tends to move upwards or downwards upon completion of the pattern. For this reason, it can often be avoided by traders. It can be viewed as the opposite of a symmetrical triangle. How Do I Recognize a Broadening Bottom Futures Chart Pattern? A broadening bottom is comprised of diverging support and resistance lines and resembles a megaphone. The rising resistance line and falling support line continue until the trend reverses. 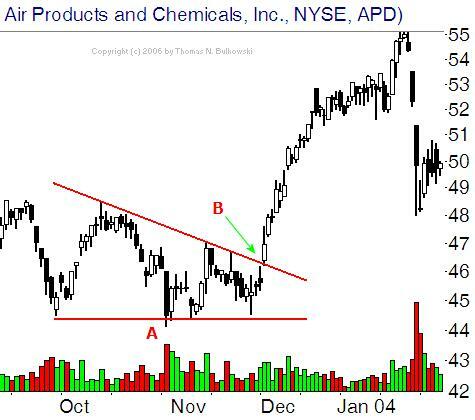 What Does a Broadening Bottom Chart Pattern Mean? This is a less common futures trading chart pattern pointing to a highly unstable market. As support drops and resistance rises, volatility increases. What is a Cup and Handle Futures Chart Pattern? An cup and handle is a bullish continuation pattern which can mark a pause in an up-trend before it continues. 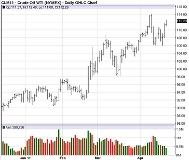 How Do I Recognize a Cup and Handle Futures Futures Chart Pattern? 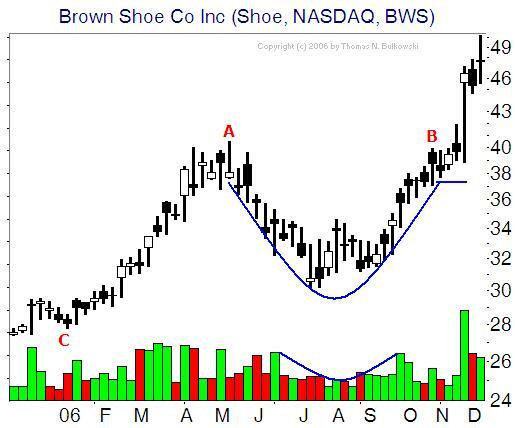 What Does a Cup and Handle Chart Pattern Mean? Resistance is tested in a unique way in this pattern, and it can be helpful to watch how the handle is formed. One possible rule of thumb is that the handle can comprise about one third of the movement of the cup portion of the pattern. What is a Descending Triangle Futures Chart Pattern? How Do I Recognize a Descending Triangle Futures Chart Pattern? An descending triangle is formed when support remains flat as resistance drops. What Does a Descending Triangle Chart Pattern Mean? The price will rise and fall within the triangle until support and resistance converge. At that point, the apex, breakout occurs, usually downwards. Note that in the above example, the price moves upwards on completion of the pattern. 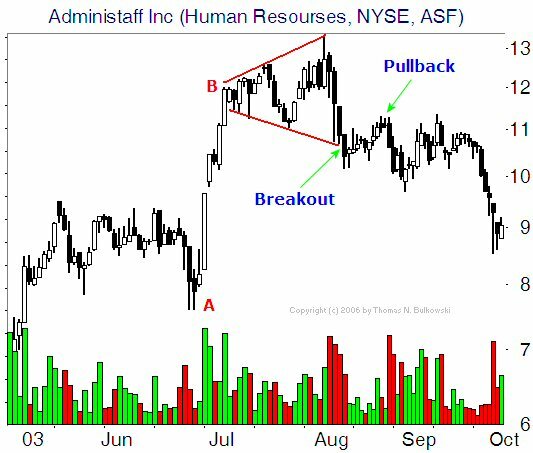 This is not as common but it is important to be aware of all the potential movements when using chart patterns. What is a Diamond Bottom Futures Chart Pattern? A diamond bottom is a bullish reversal pattern that can mark the beginning of an upward trend. How Do I Recognize a Diamond Bottom Futures Chart Pattern? A diamond bottom is formed when a price trend begins to widen and then narrows. 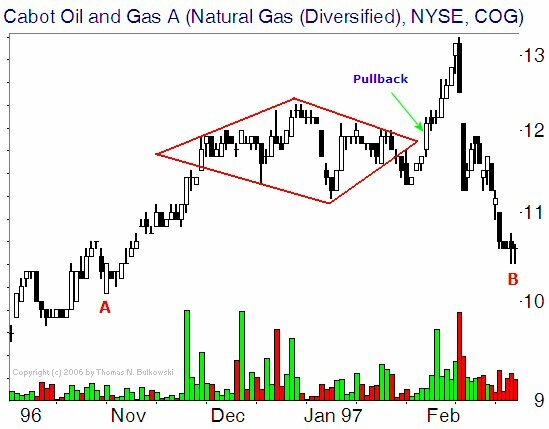 First, identify an off-center head and shoulders pattern. Then, draw support and resistance trendlines. The insuing shape closely resembles a diamond. What Does a Diamond Bottom Chart Pattern Mean? Since it is a bullish reversal pattern, a diamond bottom can indicate that a stready downtrend is about to reverse and one could long the market. What is a Diamond Top Futures Chart Pattern? A Diamond Top is a bearish reversal pattern that can mark the beginning of a downward trend. How Do I Recognize a Diamond Top Futures Chart Pattern? A diamond top is formed when a price trend begins to widen and then narrows. What Does a Diamond Top Chart Pattern Mean? Since it is a bearish reversal pattern, a diamond top can indicate that a stready uptrend is about to reverse and one could short the market. What is a Double Bottom Futures Chart Pattern? 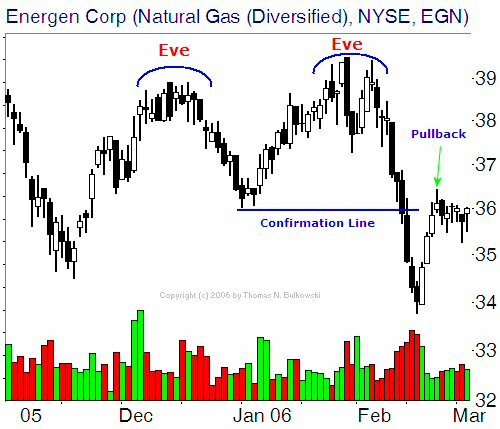 A Double Bottom is a reversal pattern that occurs at the peak (eve on the chart to the right) of a downward trend and can mark the beginning of an upward trend. How Do I Recognize a Double Bottom Futures Chart Pattern? 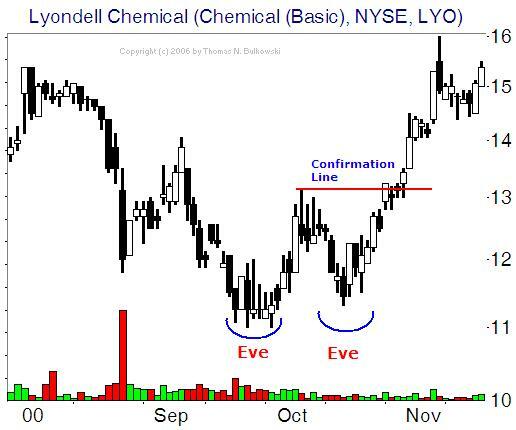 What Does a Double Bottom Chart Pattern Mean? A double bottom chart pattern can point to a tug of war between buyers and sellers. While sellers try to push the contract, buyers resist the downward trend. When once again the bottom of the pattern isn't broken, the sellers begin to back off, leading the buyers to dominate and send the trend upward. Watch the new upward trend, as it may drop back down to the breakout point to test the new support. What is a Double Top Futures Chart Pattern? A double top is a reversal pattern that occurs at the peak (eve on the chart to the right) of an upward trend and can mark the beginning of a downward trend. 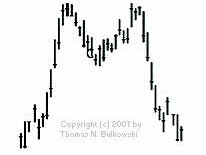 How Do I Recognize a Double Top Futures Chart Pattern? 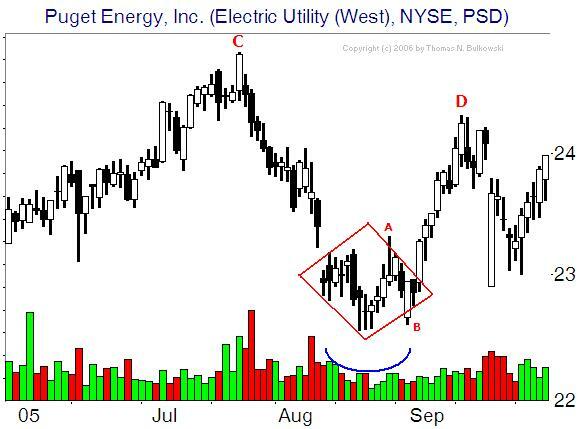 What Does a Double Top Chart Pattern Mean? A double top chart pattern can point to a tug of war between buyers and sellers. While buyers try to push the contract, sellers resist the upward trend. When once again the top of the pattern isn't broken, The buyers begin to back off, leading the sellers to dominate and send the trend downward. Watch volume in this scenario, as it is likely to increase once the contract is below support. This support level may now become a new resistance level in the new trend. Note that a similar chart pattern is the Big M, which has all the principles of a Double Top, but with much steeper moves. The Big M is displayed to the right. What is a falling wedge Futures Chart Pattern? 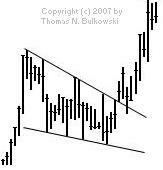 A falling wedge is a bullish reversal pattern. It can indicate that a downtrend in a upward moving market is about to end. How Do I Recognize a Falling Wedge Futures Chart Pattern? As the price in a bull market moves down, the distance between highs and lows grows smaller and smaller, until support and resistance converge and the price makes a upturn. What Does a Falling Wedge Chart Pattern Mean? To be sure that this is indeed a falling wedge and a reversal is about to happen, watch volume, as it should be increasing. Go to page two of the Futures Trading Chart Patterns - Advanced Futures Trading educational material. 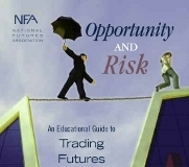 Trading commodity futures and options involves substantial risk of loss. The recommendations contained are of opinion only and do not guarantee any profits. These are risky markets and only risk capital should be used. Past performances are not necessarily indicative of future results. This is not a solicitation of any order to buy or sell, but a current futures market view. Any statement of facts herein contained are derived from sources believed to be reliable, but are not guaranteed as to accuracy, nor they purport to be complete. No responsibility is assumed with respect to any such statement or with respect to any expression of opinion herein contained. Readers are urged to exercise their own judgment in trading!